In 1994 I bought a promotional cd-single of Heart's 'Black on black'. It turned out to be a cover version of a song originally performed by Dalbello. Heart's version rocked a lot, so naturally I became rather curious about the original song. Lisa Dalbello released her fifth studio album 'She' in 1987. It included her biggest hits, 'Tango' and 'Black on black'. 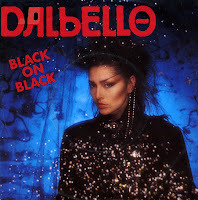 Even though it is described as a rock album, I have to say that her version of 'Black on black' sounds rather mechanic.